Independence Day - A remake of The War of the Worlds? 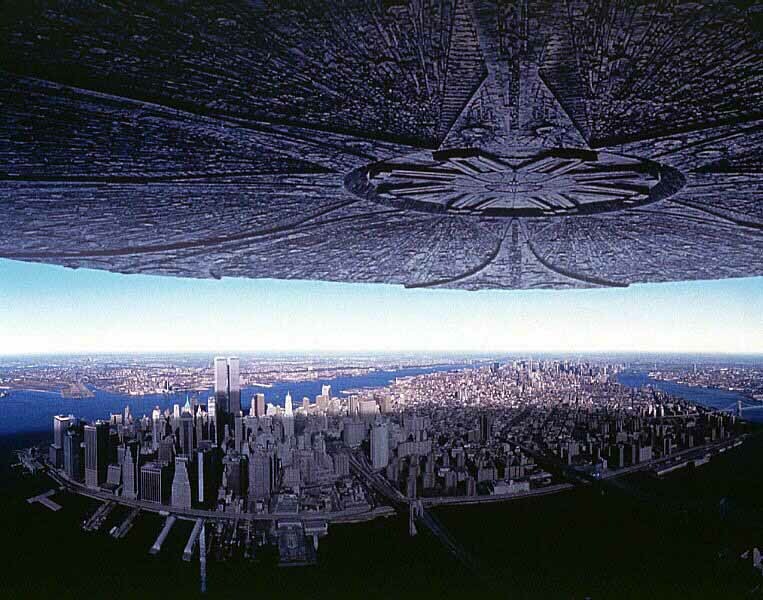 A month from now the eagerly awaited sequel to 1996's sci-fi movie Independence Day will invade theaters worldwide with Jeff Goldblum and Bill Pullman returning to help save mankind from the resurgence of the alien invaders that attempted to eradicate mankind from the face of the Earth 20 years ago. Independence Day: Resurgence will also see returning cast members Judd Hirsch, Vivica A. Fox, and Brent Spiner joined by newcomers Liam Hemsworth, Jessie Usher, Maika Monroe, Sela Ward, Angelababy, Charlotte Gainsbourg and William Fichtner. Directed by Roland Emmerich, who also co-wrote the movie with Producer Dean Devlin (and Nicholas Wright, James A. Woods, and James Vanderbilt) Independence Day: Resurgence sees the return of the filmmaking duo that defined sci-fi blockbuster cinema in the nineties and the noughties with movies such as Universal Soldier, Stargate, Godzilla, The Day After Tomorrow and 2012. Critical opinion of Emmerich and Devlin's movies may range widely among science fiction fans, but there is no denying the duo's ability to produce and market epic cinematic set pieces destined to be, and best experienced on the big screen. Many science fiction fans will look back with great nostalgia to the 1996 original which also starred Will Smith, Mary McDonnell, Margaret Colin, the unforgettable Randy Quaid and the late, great Robert Loggia. Yet even when watching this movie on opening night in my local theater, sat next to a duo of pizza devouring morons, I couldn't escape a strange, familiar feeling. Independence Day, while having its typical Hollywood brashness to it, was a more seminal movie than maybe critics and fans give it credit for. Take the opening scene to 2012's Prometheus, in which we are shown a primordial world. Before we are introduced to the Engineer that sacrifices his life, to ultimately create life, we see a series of shots showing the shadow of something large crawling across the landscape - the very same iconic imagery (pictured below) that was used throughout 1996's Independence Day, showing that even Ridley Scott was influenced by the movie. But the movie itself was influenced by another that had come before it, long before it. Critics have been keen to point out that Independence Day is almost an amalgamation of every iconic science fiction film from the 1950's onwards, but while sitting dead center in the front row (the best seat in my opinion) of the theater back in 1996 I could only think of one movie that Independence Day kept reminding me of, 1953's The War of the Worlds. The air of familiarity was there throughout the movie, but it was when the alien invaders survived a nuclear attack unscathed that made me almost say out loud, "This is a remake of the War of the Worlds". Throughout Independence Day, there are numerous scenes similar to those in the 1953 classic that starred Gene Barry and Ann Robinson - the deadly beam weapon, the disastrous attempt to make peace with the aliens, but after the nuclear attack scene, there was one more that literally made me roll my eyes in its blatancy - When Jeff Goldblum's character David Levinson is struck with the idea, courtesy of his father Julius played by Judd Hirsch, to use a virus to attack the aliens technology. The comparisons to how the Martians were defeated by the germs, bacteria and viruses of Earth are so blatant one wonders how Hollywood gets away with such writing. We are taking Batman v Superman's infamous 'Martha' scene levels of stupidity here. 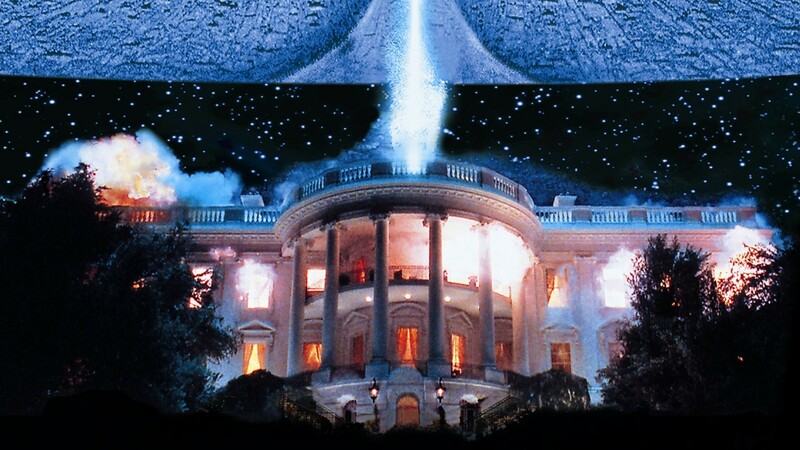 Don't get me wrong I loved, and still love Independence Day - the way the opening credits interact with my surround sound, Will Smiths many awesome lines, Julius Levinson calling everyone 'Vultures', David's gravel-voiced boss, Randy Quaid's iconic performance. Independence Day is a guilty pleasure that I am not ashamed in admitting to enjoying, its just that part of me wishes that Emmerich and Devlin had had the professional decency to acknowledge, at least in the credits that at the end of the day it was a reimagining of, an adaptation of the 1953 version of H. G. Wells' The War of the Worlds. Directed by Roland Emmerich, Independence Day: Resurgence's release date is June 24th, 2016. Stay up to date with the latest news on Independence Day: Resurgence by liking Scified on Facebook and by following us on Twitter and Instagram! Also, consider subscribing your email to our Independence Day Resurgence blog for instant notifications of when new posts are made! Enjoy 15 pieces of rare Independence Day: Resurgence concept artwork! Sideshow Collectibles unveil life-size Independence Day Alien statue! 5 cool things we learned about Independence Day's Aliens in Resurgence! 4 Fan responses to Independence Day - A remake of The War of the Worlds? I'm not sure I'd say a remake. The movies owes just as much to the much less popular Earth vs The Flying Saucers, it seems like a blend of the two. It has a lot of similarities to both but I have to go with critics and say it was a blend pretty much every aliens attack plot that came before it. I enjoyed the first ID, but it was so over the top, and if I remember correctly had a lot of symmetrical framing that really highlighted the collaged photography in an unpleasant way. Definitely big time WotW parallels, and let's add to that a blatant rip off of the Alien creature as well. I can kinda forgive the first, WotW being the first and finest invasion story, and many forms of media borrowing heavily from it since. The MORB parallels are less fogiveable. It cheapens the movie when some thought and creativity could have surely produced a more original creature. Now, this design has been referenced heavily too, but in a production as ambitious as ID they should have tried harder. While I'm at it, I also enjoyed many aspects of Spielbergs WotW, with the biggest exception being the creatures. Lazy, boring design. Making things overly complicated seems to be the fashion now, you'd think Spielberg would have the good taste to sidestep that. He missed a huge opportunity, there. George Pal's Martians were as creepy and inexplicable as anything ever, wouldn't you want to at least try to hit that note? And Wells' Martians were quite horrific too, as were the tripods and their behavior. I understand it's harder to be original now, but it's not impossible. It's hard to call out Independence Day as the only film guilty of borrowing tremendously from films which came before it. They're all guilty. Only a select few really stand out as being something"fresh". ID4 is indeed a guilty pleasure for me as well, I love the characters, I love the dialogue and I actually really liked the Aliens. Sure it's a culmination of many sci-fi greats, but isn't imitation the sincerest form of flattery? In today's Hollywood it's difficult to be original. Original ideas are generally shot down, under-funded and/or perform poorly at the box office. I think if we as an audience showed with our wallets that original ideas are more welcome, it would elicit the appropriate response from filmmakers and screenwriters alike. Either way, I'm one who enjoys Independence Day for what it is - an event film, with large scale, big explosions and an entertaining cast. It's no ALIEN and certainly no WAR OF THE WORLDS, but it is enjoyable as its own property. Well, guys, D&E actually SAID ID4 was supposed to a spiritual remake of War of the Worlds. So, it wasn't an accident. zindara commented on Extended 'LIFE' movie sneak peek shows the hostile Alien lifeform in action! Tayla Mayde commented on Watch the new 5 minute HBO Godzilla: King of the Monsters trailer here now! from the Godzilla Movies website! Godzillatheking123 replied to What is Godzilla's true origin? FMAChet commented on Watch the new 5 minute HBO Godzilla: King of the Monsters trailer here now! from the Godzilla Movies website! Godzillatheking123 commented on NEW 2:16 minute long Godzilla: King of the Monsters trailer dropping soon! from the Godzilla Movies website! Godzillatheking123 commented on Watch the new 5 minute HBO Godzilla: King of the Monsters trailer here now! from the Godzilla Movies website! Gmkgoji commented on Watch the new 5 minute HBO Godzilla: King of the Monsters trailer here now! from the Godzilla Movies website! Titan of Water commented on Watch the new 5 minute HBO Godzilla: King of the Monsters trailer here now! from the Godzilla Movies website! Watch the new 5 minute HBO Godzilla: King of the Monsters trailer here now! 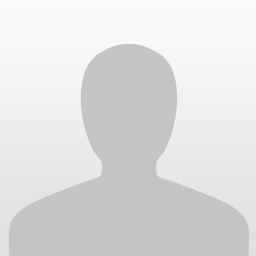 just surpassed 1,000 views! Chris posted a new editorial: Watch the new 5 minute HBO Godzilla: King of the Monsters trailer here now!